Welcome to the inaugural post on Sound of Muses! This blog will serve as a collection of my musings about emerging media, with an emphasis on how these types of media can be used in the integrated marketing communications process. Over the next nine weeks, the topics will parallel my course work in IMC 619: Emerging Media and the Market. However, my hope is that this course will serve as the foundation for future postings about the impact emerging media has on our world and on our daily lives. To begin, I wanted to share my thoughts about why emerging media matters. As marketers, we often think of emerging media in terms of its impact on commerce. From a market perspective, new media has certainly equaled the balance of influence between brands and consumers. It has given consumers a voice and an avenue to create their own content. There’s clearly no questioning new media’s collective power. For example, Millennials now trust user-generated content 50% more than other media. This is especially important because Millennials will soon have the biggest combined purchasing power in history. But beyond commerce, emerging media has meaning. It provides us with new and better ways to communicate. In the aggregate, emerging media is changing the world we live in. A great example of emerging media’s influence can be found in the middle east. 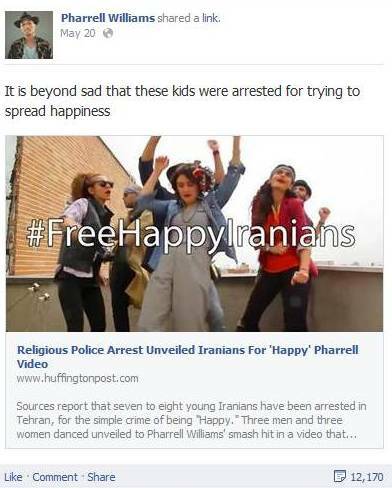 You may be familiar with a developing story out of Iran, where six people were arrested for dancing in a You Tube video to the Pharrell Williams’ song “Happy”. Police in Iran considered the video obscene, and ordered the participants to repent on state TV before sending them to jail. By western standards, the video is nowhere near obscene. But the incident has caused a major stir in Iran. Many have come to the aid of those arrested, including Pharrell Williams and human rights organizations. While the story itself is compelling, I couldn’t help but be amazed at the role emerging media has played throughout the events. First, the user-generated video was created and uploaded to You Tube. The video quickly went viral, and currently has over a million views. After the arrests were made, the hashtag #freehappyiranians became a forum for people to show support and share information. Pharrell Williams promoted the hashtag on his Facebook and Twitter pages, significantly widening the scope of awareness. Soon after, Iranian president Hassan Rouhani made a political statement condemning the arrests. But he didn’t take to traditional media outlets to address the public. Instead, he took to Twitter. Within hours after Rouhani’s tweet, the six participants were released from jail. How do we know? Instagram! One of the women arrested announced on her Instagram account that she had been freed, and thanked those who supported her. All of these events played out via new media outlets, taking a local issue in Tehran and placing it on a global stage. And all of this happened while Twitter and Facebook are officially banned in Iran! Coverage of these events has now spread to numerous online news outlets around the world, and has been reported in traditional media as well. The not-so-happy story from Iran illustrates just how powerful new media can be. It shows how user-generated content can quickly go viral, how people can communicate with a global audience without the use of traditional media, and how political leaders can make powerful statements in 140 characters or less. It shows that even those who are oppressed in parts of the world are globally connected to those who can help. A tweet can help close the gap between religious oppression and the freedom of expression that we enjoy here in the western world. Just some food for thought as we enjoy this Memorial Day weekend.